Joerg Bondzio outside his Holiday home within his Sporting Scotland estate at Corglass Lodge, Ballindalloch. Blades up to 500ft off the ground could be built less than a mile from Joerg Bondzio’s home of more than 20 years near Knockando. Energy giant Fred Olsen Renewables have now submitted final plans to extend its Paul’s Hill wind farm with seven extra turbines. Yesterday, Mr Bondzio, owner of Sporting Scotland, explained he feared the development could be just the start of a wave of sites that could radically alter the landscape. He said: “We have been here 21 years, long before there was any talk of turbines. Now we’re the ones who are going to live with the effects. “Our holiday visitors always comment on the isolation and the untouched wild moors – now we’re going to have obscene turbines less than a mile away, in full uninterrupted view. It’ll ruin the business. Mr Bondzio welcomes guests of some of the area’s biggest whisky brands, who arrive by helicopter, to enjoy fishing, off-road driving and kayaking on the River Spey. Fred Olson Renewables is also in the early stages of planning up to 29 turbines that could be more than 700ft tall as part of the Rothes III development, north of Archiestown. A further 63 turbines up to 570ft tall are also in early planning as part of Force 9 Energy’s Clash Gour project, which will almost circumnavigate the existing Berryburn turbines to the north-east of the Paul’s Hill site, where 28 turbines that are 320ft tall became operational in 2006. 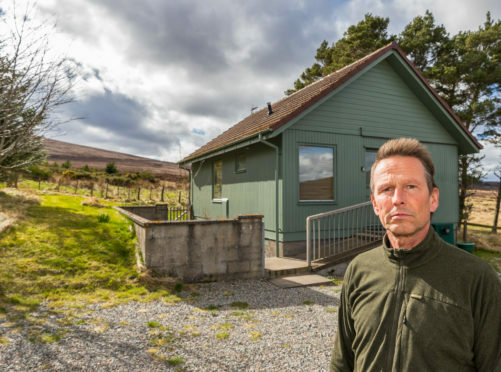 Speyside Glenlivet councillor Derek Ross, who led a successful campaign against the Brown Muir wind farm near Rothes, said: “We can’t keep expecting to attract tourists to the area if these are the sorts of things we are going to allow.